I guess that makes all the difference. Pfffft! The blast happened less than a week after President Trump sparked violence in the Middle East by officially recognizing Jerusalem as Israel’s capital city. I think Ashley Collman has a few screws loose. Our revenge. Throw him out. Throw his parents out. Throw his family out. Eject his Imam. Shut down his mosque. 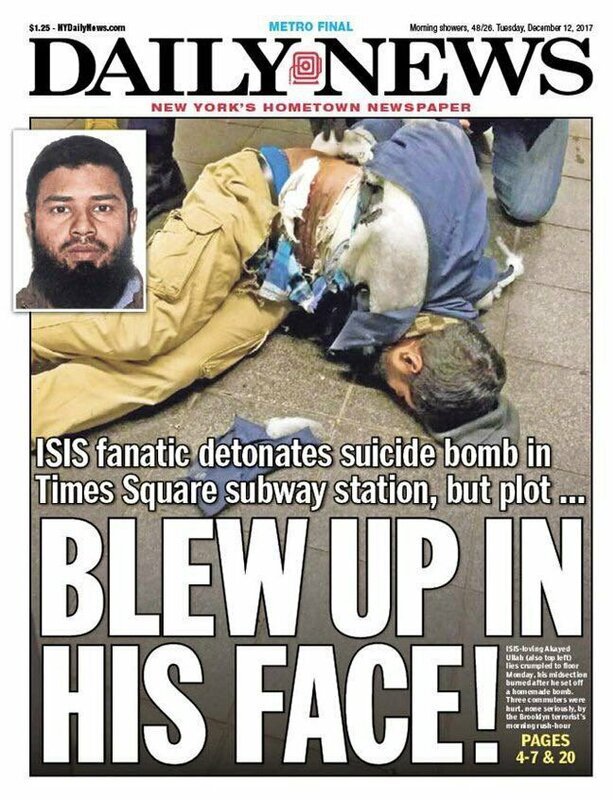 Details emerge regarding Akayed Ullah, the devoted servant of Islam who couldn’t even blow himself up, much less anybody else. Ullah had wires attached to him and was armed with a pipe bomb and a battery pack, which he tried to set off in the subway around 7.20am (11.20pm AEDT) Monday local time, according to police sources. CNN reported Ullah had pledged allegiance to ISIS while talking with authorities. That claim is now being investigated. As it should be. CNN is notoriously unreliable. 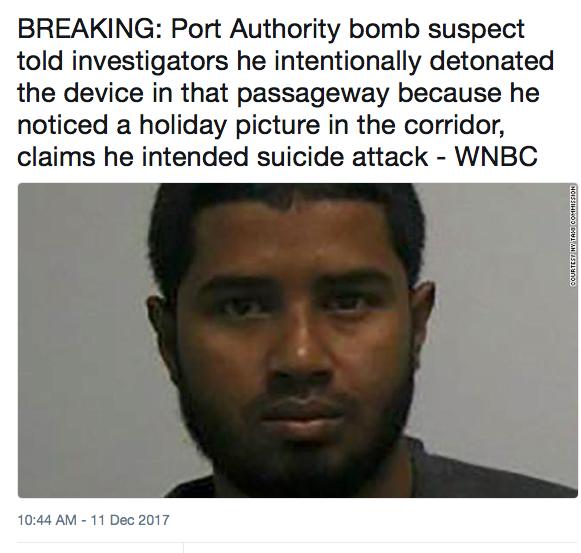 The New York Post reported that the bomber fashioned his crude explosive device out of a 13cm piece of pipe, a 9-volt battery, sugar, match heads, Christmas tree lights and screws — but it only partially detonated, according to law enforcement sources. According to the publication the pipe wasn’t packed tightly enough to explode, so when the festive lights sparked the matches, it just blew the ends off the pipe rather than sending the shrapnel flying. Christmas tree lights are often used as detonators in home-made bombs — the Boston marathon and London subway terrorists both used the seasonal decor to ignite their charges. That’ll teach those infidels. By the way, never let it be forgotten that following the Boston bombing Waleed Aly wrote about the “very real suspicion that the perpetrators here are self-styled American patriots”. He also described CNN as “reputable”. Inspired by ISIS or Islam? What did he really say? Can we see the transcript? it matters, because the investigators likely substitute ISIS for islam or jihad, so that it doesn’t make islam look bad.